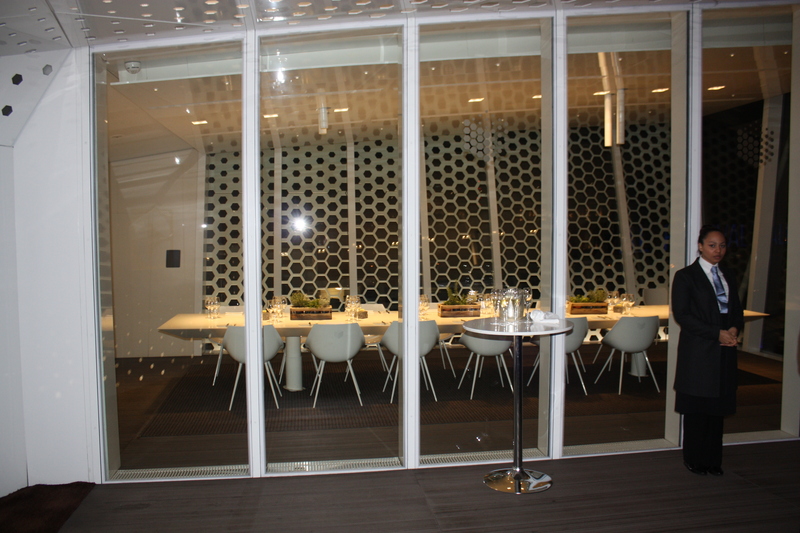 The concept behind The Cube by Electolux – a “pop up restaurant” – is intimate and original. 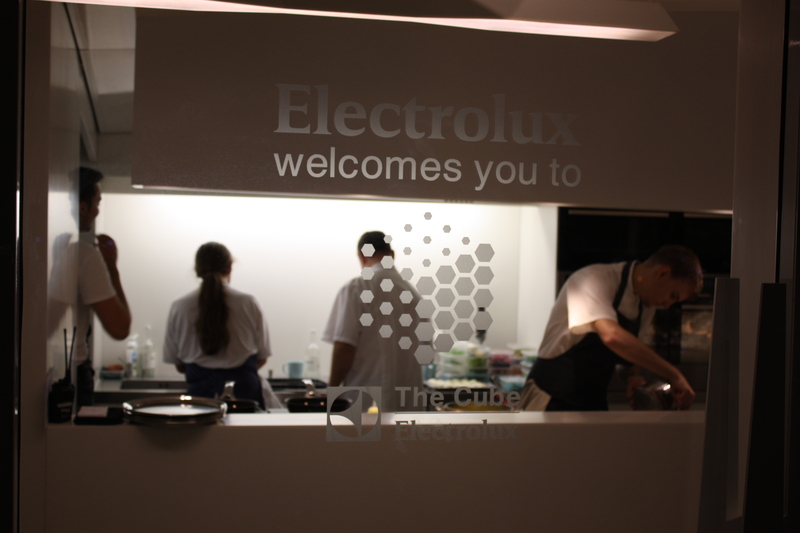 Sponsored by Electrolux, the restaurant showcases the use of Electrolux products by a roster of Michelin chefs who rotate kitchen duties on a weekly basis. The restaurant, seating only 18 guests, is perched on the 6th Floor of the Royal Festival Hall, and its glass-paneled walls offers luxurious views of The Thames, Big Ben and The Houses of Parliament. An open-plan kitchen affords diners an interactive and visual experience with the Michelin chef in residence. 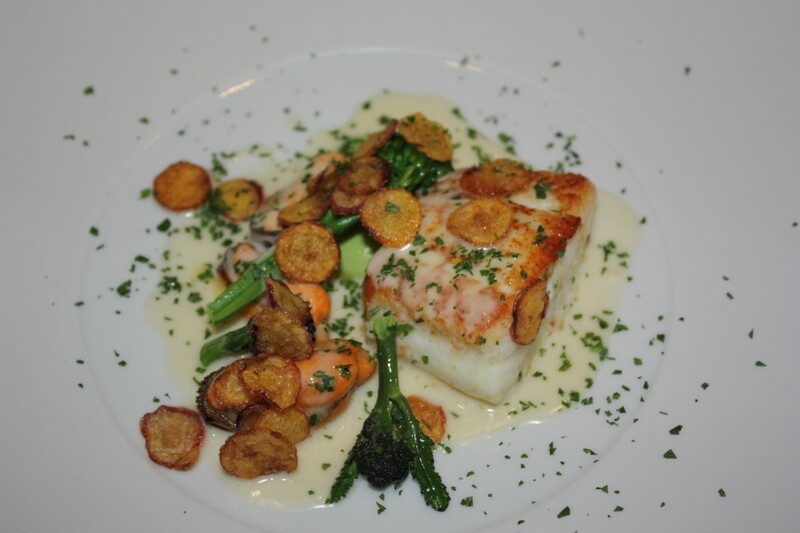 Lunch is priced at £175 and dinner is £215 for a minimum six-course meal and matching wines. There is also a champagne reception which is enjoyed on the balcony – a treasured moment to allow all guests to drink in the gorgeous views. I dined at The Cube last Sunday and discovered that the beauty of visiting The Cube on a Sunday evening is that the incoming chef for the following week also dines as a guest. 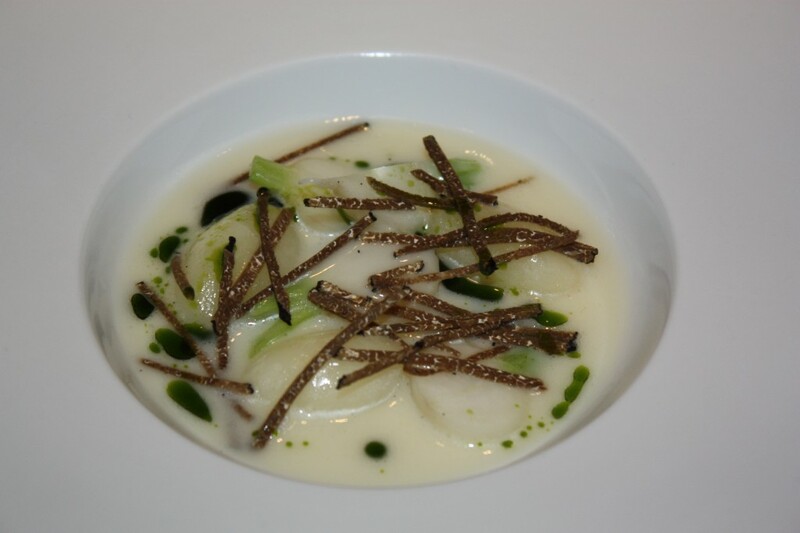 Therefore you get to have the audience of not just one, but two esteemed Michelin chefs. Chef Simon Rogan may have been the one cooking, but I also got to chew the ever-cheerful Tom Kerridge’s ear off about the joys and tribulations of being a twice Great British Menu winner as he sat across the table from me. Rogan’s menu was aptly named “A taste of Cumbria” and embraced the diverse choice of home-grown and hand picked ingredients for which his restaurant L’Enclume in Cumbria is famed, and which is also a trademark of his London restaurant Roganic. 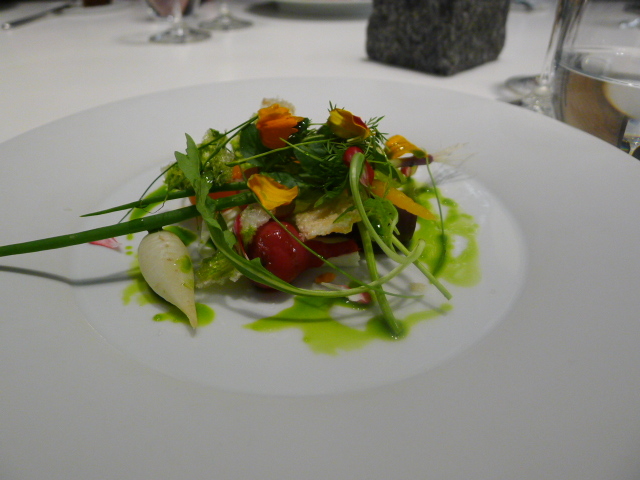 All the produce in capitals below have either been grown by Rogan or foraged from the Cumbrian valley around L’Enclume. To go with our champagne reception on the balcony were canapés of bay crab and SEA HERBS on crispy bread. The crab was beautifully sweet and fresh. 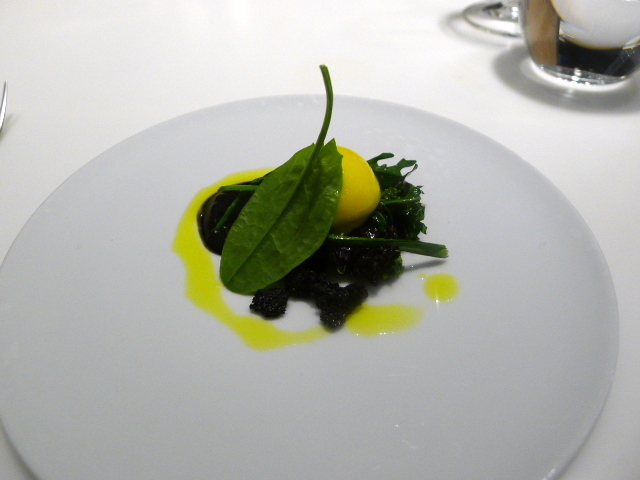 The meal kicked off with a cod mousse, subtly combined with squid ink and rapeseed oil and finished with four different types of KALE and sorrel. The flavours were gentle and delicate. A TURNIP broth with fresh turnips and Westcombe cheddar cheese dumplings was stunning. The broth was light, yet intensely sweet, and the turnips were crunchy and wonderful. The dumplings were delicious as well, proving fluffy and airy. 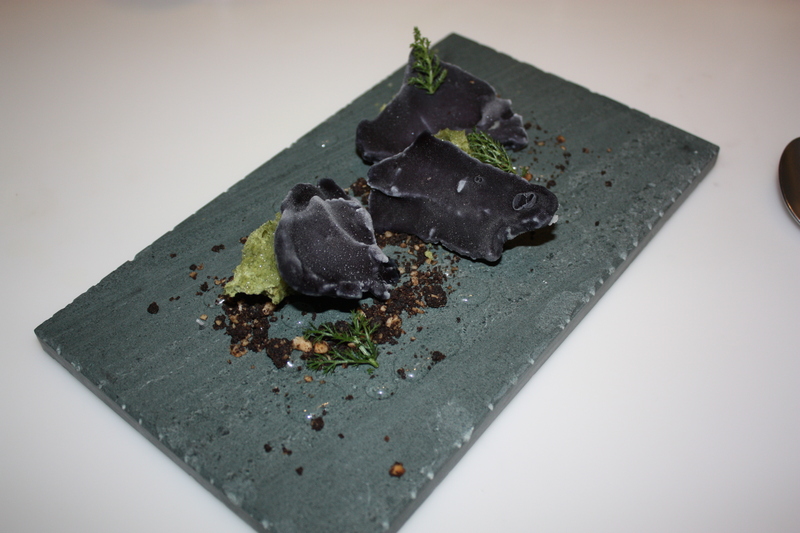 To complete this yummy dish were some English truffles and an elegant APPLE MARIGOLD oil. 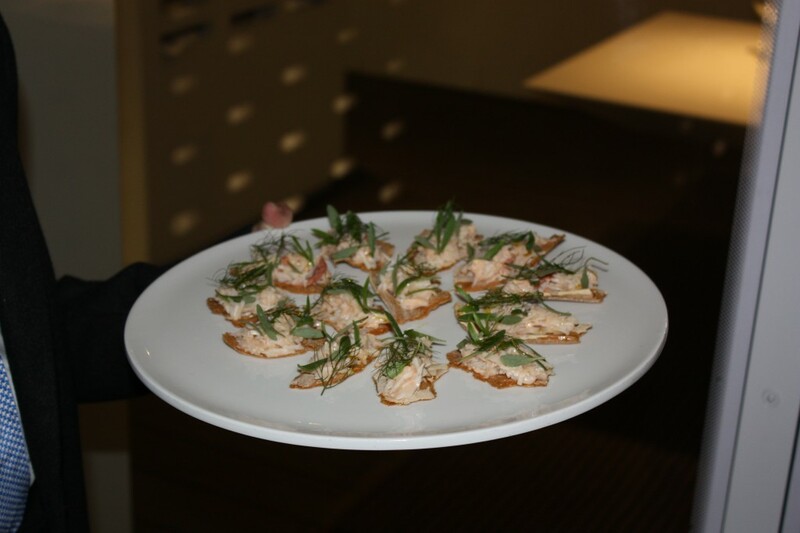 AYNSOME’S AUTUMN OFFERINGS was a showcase in delectable fresh herbs and vegetables with at least 23 different varieties on the plate. 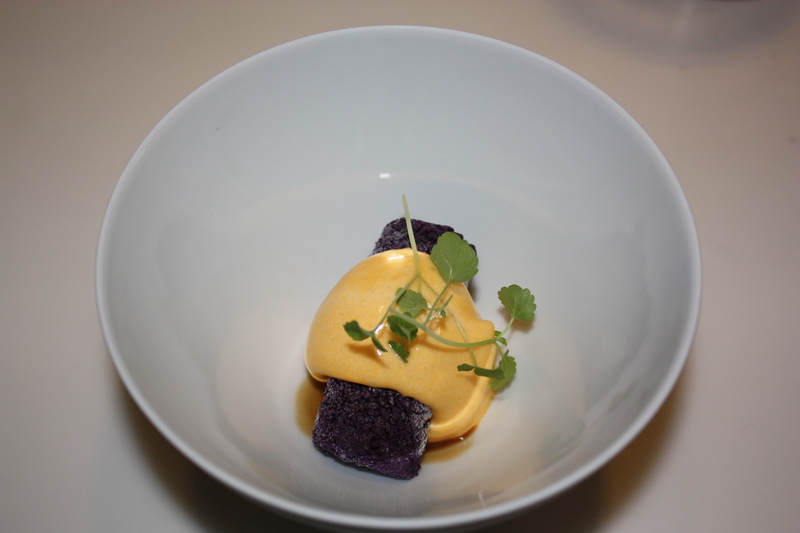 For added flavour and texture were some buffalo curds and puffed pork skin. The finishing touch was a hint of some garlic and chilli oil. Plaice poached in brown butter was beautifully cooked and served with tasty mussels, RED RUSSIAN (kale) and deep-fried OXALIS ROOT for a hint of crunch. This was a lovely dish. 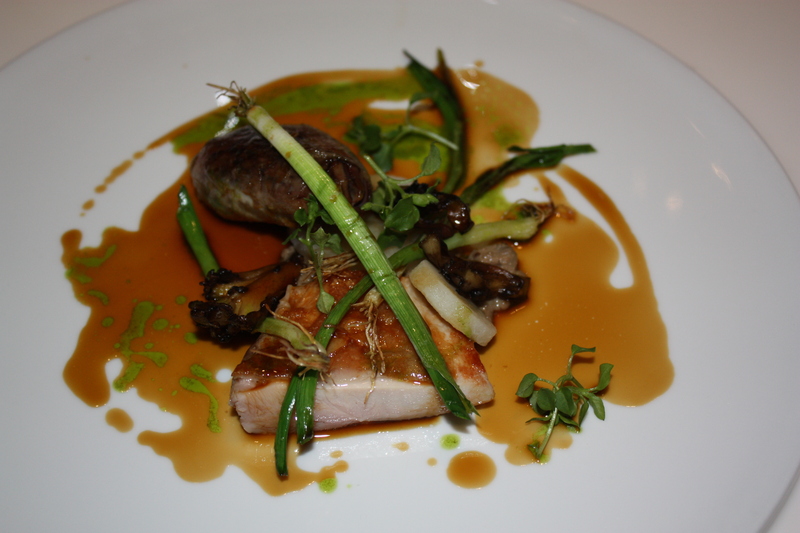 Guinea hen served two ways (breast and thigh) was tasty but a little dry. However the accompaniment of LEEK was amazing and sweet. Also delicious was the offal ragout with liver, hearts and gizzards. It was rustic, comforting and really well done. To finish the dish was some PENNYROYAL (mint) and Cowmire cider. The pre-dessert was a whole meal stout parfait with BLACKBERRY, liquorice and SEA BUCKTHORN sorbet that proved interesting. The liquorice was an acquired taste, but both it and the acidity of the fruits provided interesting contrasts. The dessert, a Cumbrian slate with apple sorbet, dehydrated LEMON VERBENA cake for a spongy texture and distilled VERBENA was perplexing and conceptually difficult to understand. It was difficult to be drawn to this dish. With its diversity and range of ingredients used, this was a well-considered and cleverly designed menu, which embraced the best that Cumbria had to offer. I also lucked out as I got to dine with a really nice bunch of people who made for great company. The service was also attentive and charming, but I must caveat that by mentioning that there were only nine diners rather than the maximum 18 possible. However, the biggest let down of the evening was how cold it was inside the Cube. By the end of the night I was frozen to the bone. But the setting that makes up ‘The Cube’ with all its views is truly unique. Going to The Cube is pricey though, so drink up and choose your chef well as it’s a different one every week. Simon Rogan will be cooking again the week of the 24 December and New Year’s Eve. 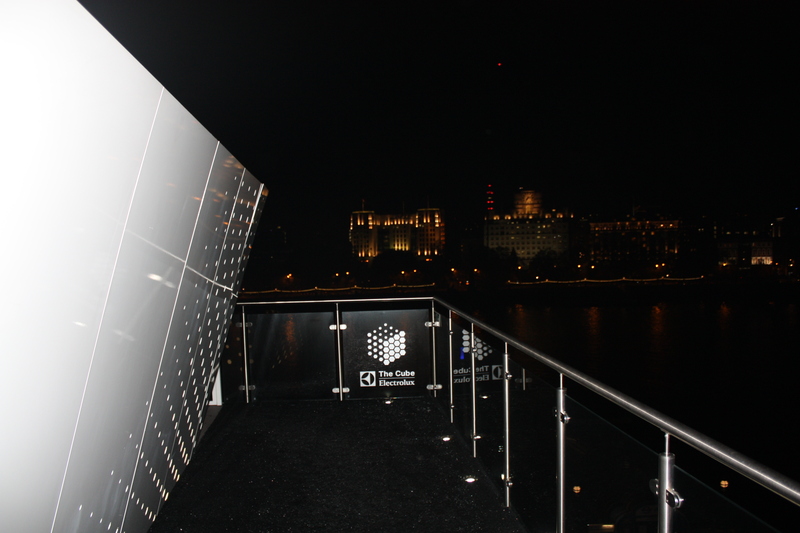 The Cube has been extended until 31 December 2012. To read Greedy Gourmet’s review click here. Hi Cassie, I’m so jealous of all these places you get to. Excellent reviews though, feels like I’m almost there. I feel sorry for all the southerners in this country that it is such a trek to get to the Lake District. It would be well worth the effort though if you do.